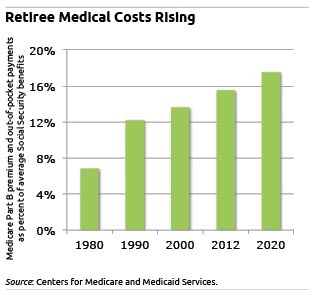 Medicare covers a large portion of health costs, but retirees must pay Medicare premiums, which are deducted from their monthly Social Security checks, as well as copayments for doctor visits and other medical services such as some tests. These additional expenses are often, though not always, covered by employer-sponsored or private “Medigap” insurance policies, which smooth out these expenses for retirees. But out-of-pocket expenses not covered by Medicare will be on an upward trend over the long term, despite a temporary dip in recent years, according to forecasts from the Centers for Medicare and Medicaid Services. For the typical beneficiary, out-of-pocket costs will increase to about 18 percent of Social Security benefits over the next decade, up from 15.5 percent currently. These costs do not even include the premiums for Part D coverage of prescription drugs. When Part D costs are included, the health care bite this year is 24 percent of benefits – and will approach 29 percent in 2022. Retirees received no federal drug coverage prior to the Part D program signed into law by President George W. Bush. The government has estimated that Part D has saved seniors – believe it or not – nearly $4 billion since going into effect in January 2006. Squared Away readers who are already retired are welcome to comment below on the impact on their lives of rising medical costs. Your best bet is to live outside the USA and purchase coverage outside the USA. In most European countries, if you have cancer, heart disease, or are diabetic, those costs are considered to high to be borne by the individual. Remember, France is number one in health care according to WHO. The USA ranks number 34. Sadly, this is the truth. While Medicare premiums and co-pays for doctor visits has more than doubled in the last 30 years (as a percentage of Social Security benefits), Medicare beneficiary spending has dramatically declined due to the implementation of price controls – RBRVS, DRGs, balance billing, and the addition of Medicare Part D. The average annual increase in the Part B deductible, for example, has been 2.7% over the same period of time. The average annual increase in the Part B premium was ~7.6% per year, and the average annual increase in Social Security benefits was 3.5% (1980-2012). However, I certainly agree with you that Baby Boomers are “waking up” to blatant political actions that demagogue Medicare (see Nancy Pelosi) and that ignore Medicare’s long-term financing problems. Expanding coverage is just a way to buy votes (Bush, Medicare Modernization Act). When you measure out-of-pocket costs as a function of Social Security benefits, it is misleading, at best. Why not compare Medicare beneficiary out-of-pocket costs against those by workers (mostly taxpayers), who already shoulder a significant portion of medical expenses through their employer-sponsored plan. Those same plans have averaged double digit inflation since 1980, in many respects because of the cost shift from the price limits on Medicare…clearly intended to buy votes. I am an age 60 retiree from corporate America, now working in a legal capacity. The last thing we need is to direct even more resources to older, retired Americans.